OutdoorDealHound.com is a new website offering special discounts and “bundled” outdoor gear bargains from popular manufacturers including Browning, Boyt Harness Co., Leupold, Mossberg, Remington, Weatherby, Sarge Knives, Thermacell and many more. If you’re looking for a good deal on scopes, firearms, gun cases, hunting gear, boots, tents, and more, check out OutdoorDealHound.com when it launches August 10, 2010. OutdoorDealHound.com will offer more than 1,200 outdoor products. The site will also provide instant rebates, individually-tailored discounts, and bundled pricing based on the number and type of items a customer purchases and his/her demographic profile. Shoppers can identify discount opportunities by watching for icons, like dog bones, paws and padlocks. For example, the more dog bones displayed on an item’s page, the bigger the discount. 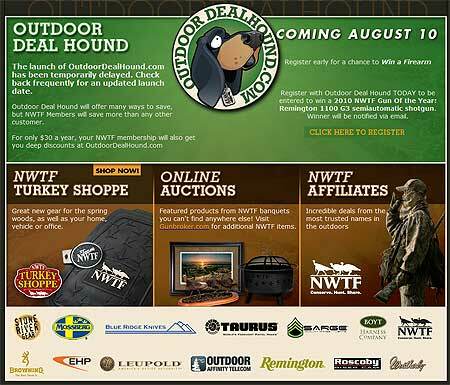 Share the post "Outdoor Deal Hound Website Will Offer Merchandise Bargains"